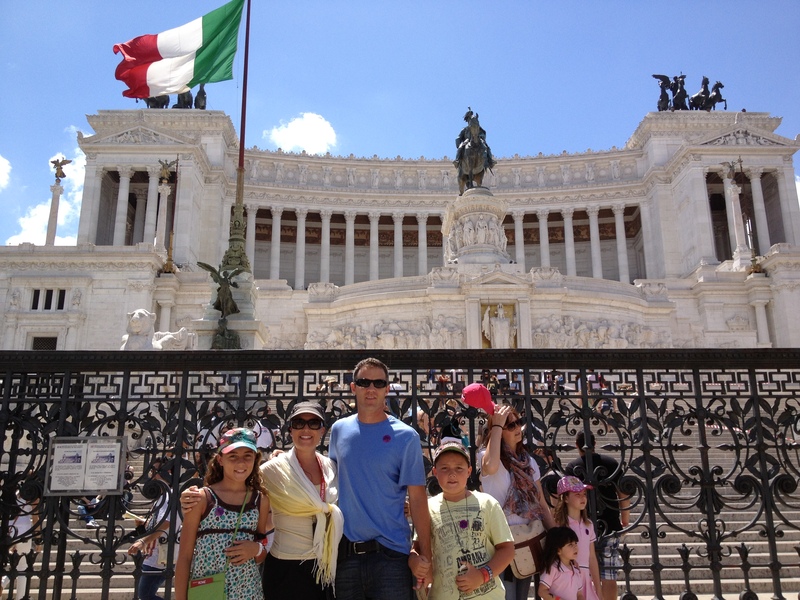 On our walking tour through Rome, we were in awe of the Victor Emmanuel II Monument and just had to take a family picture in front of the large gates. 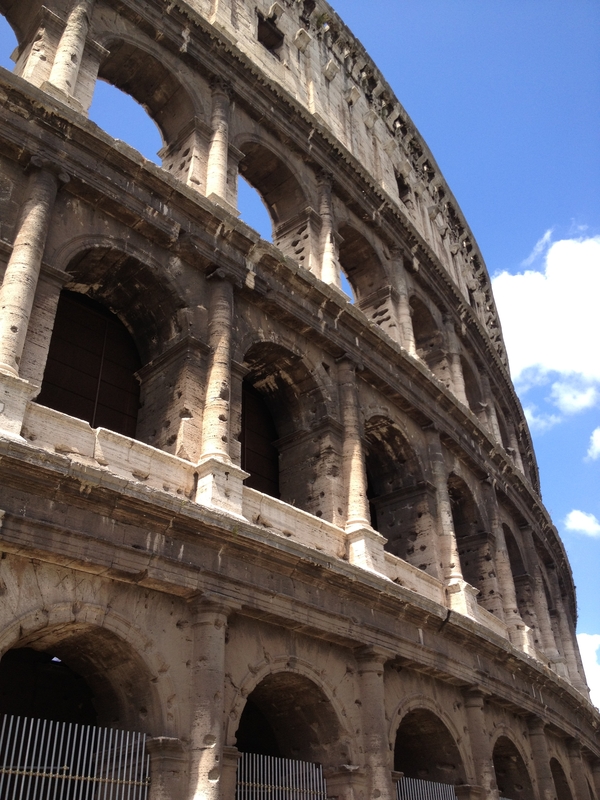 The Coliseum was one of the main reasons that we chose to visit Roma, Italy. The history of the Coliseum is fascinating of course, but we weren’t sure if the kids would find touring the Amphitheatre as exciting as we would. Prior to touring the Coliseum we took the kids to 3D Rewind Rome tour which shows what life was like for the gladiators Hollywood style. It takes you back to the time of 310 AD as you put on your 3D glasses and see what life was like as a gladiator through animation! The movie includes fighting scenes between the gladiators and shows the enormous crowds of people who would show up to the event. The museum is located around the corner from the Coliseum and you can purchase tickets the same day. After viewing the 3D movie, you enter into a glass elevator which lowers down to show what type of environment the lions were kept in and where the gladiators were fed rations. 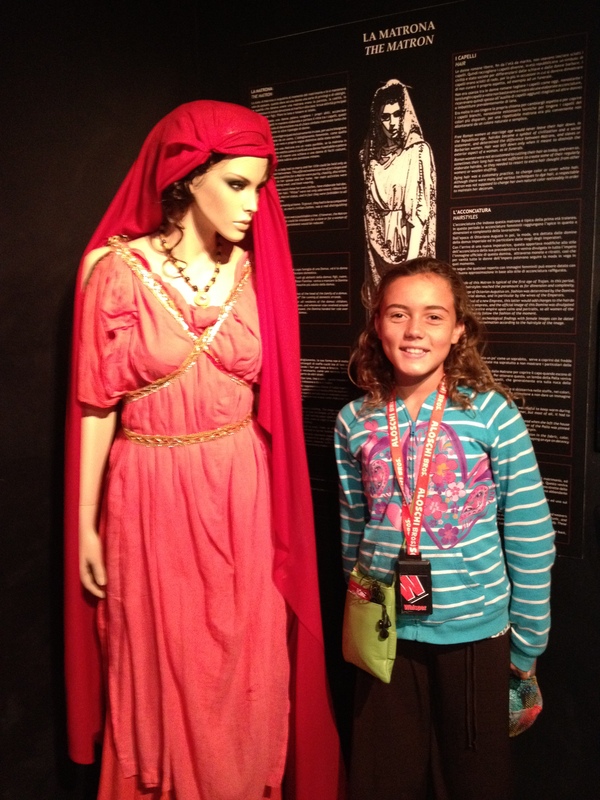 After the tour, the kids can try on costumes, view ancient artifacts and there is even an espresso bar for adults! We were very excited to view the Coliseum after taking the 3D Rewind tour as the stories of the gladiators were fresh in our mind. We took a walking tour around the outside of the Coliseum. 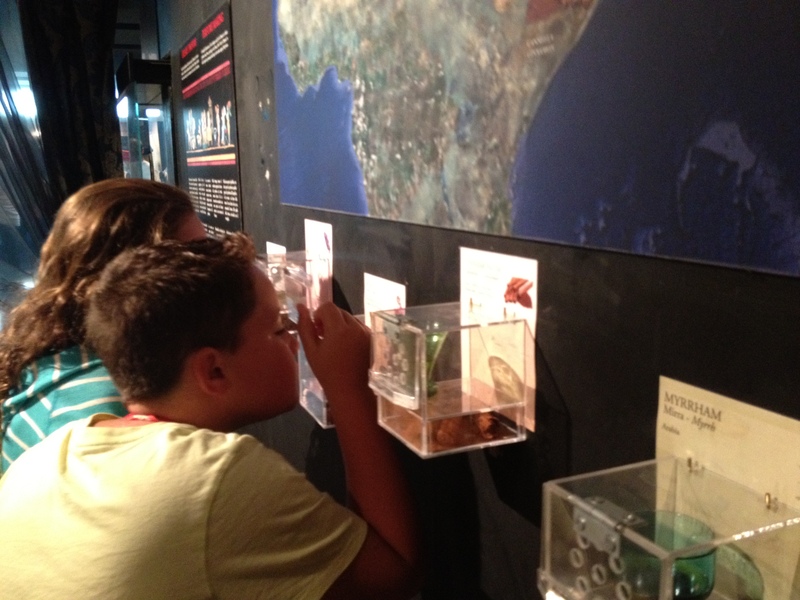 It was very interesting and not too long for the kids. However, it was about 90 degrees standing in the sun and I would highly recommend taking the tour in the morning in the summertime. There are tours which are more extinsive and take you through the inside of the Coliseum. The Roman Coliseum or Coliseum, originally known as the Flavian Amphitheatre, was commissioned in AD 72 by Emperor Vespasian. It was completed by his son, Titus, in 80, with later improvements by Domitian. 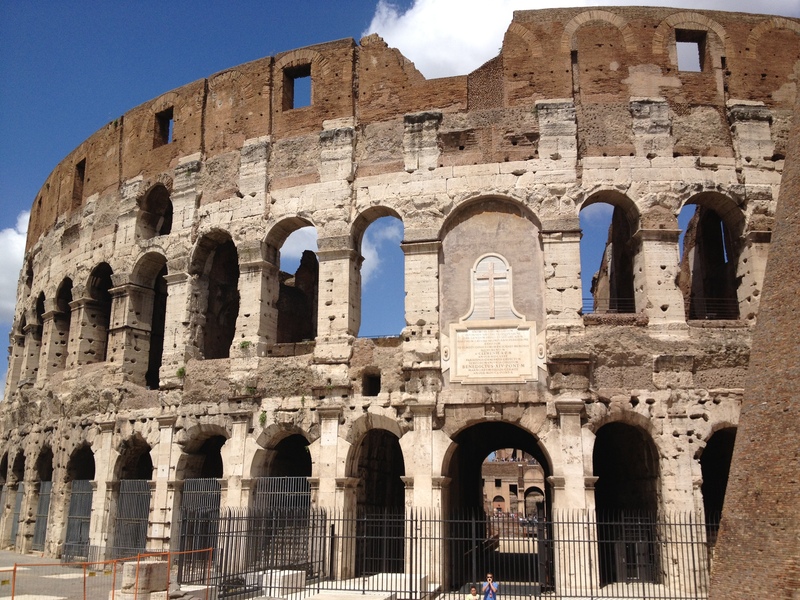 The Coliseum is located just east of the Roman Forum and was built to a practical design, with its 80 arched entrances allowing easy access to 55,000 spectators, who were seated according to rank. The Coliseum is huge, an ellipse 188m long and 156 wide. Originally 240 masts were attached to stone corbels on the 4th level. As we made our way to the Roman Forum, which I had seen many times in pictures, you just can’t imagine how large the structures really are and how close they are. There is a fence around the Forum buildings but you are still very close and can take great photos. To see the anchient buildings with a town and people now built all around it seem surreal. You can envision how the Forum came to life at one time, as the city’s most important public building. 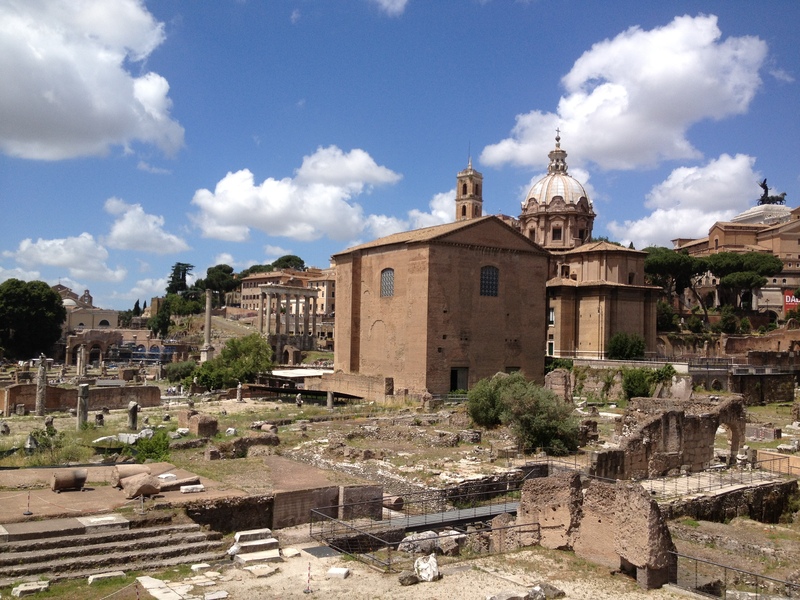 The Roman Forum (Forum Romanum) was the central area of the city around which ancient Rome developed. Here was where commerce, business, prostitution, cult and the administration of justice took place. Space where religious activities were conducted and the communal hearth of the city. The Roman Forum was designed by the architect Vitruvius with proportions 3:2 (length to width). 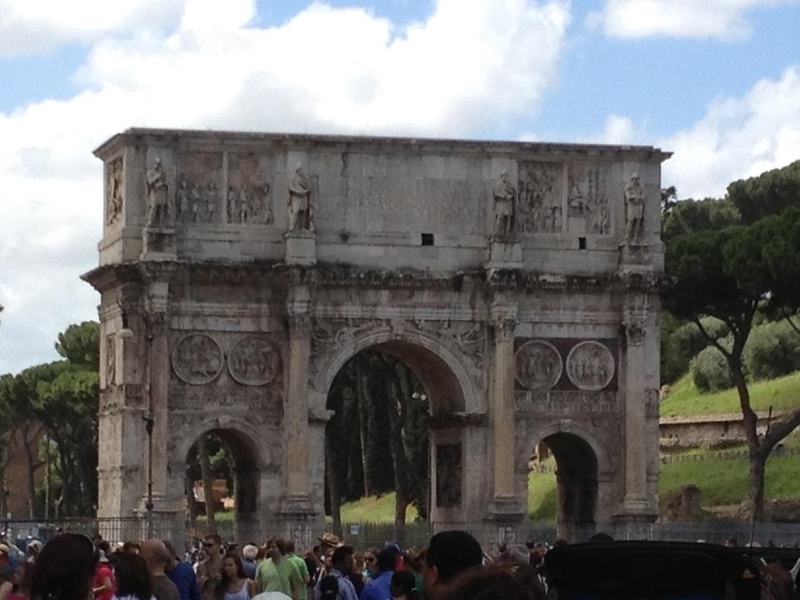 The Arch of Septimius Severus, built in AD203 and the Roman Forum Rostra or platforms for public speeches. The reliefs on the triple arch represented many of Rome’s victories over oriental tribes and the Rostra was decorated with prows of warships captured during battles. 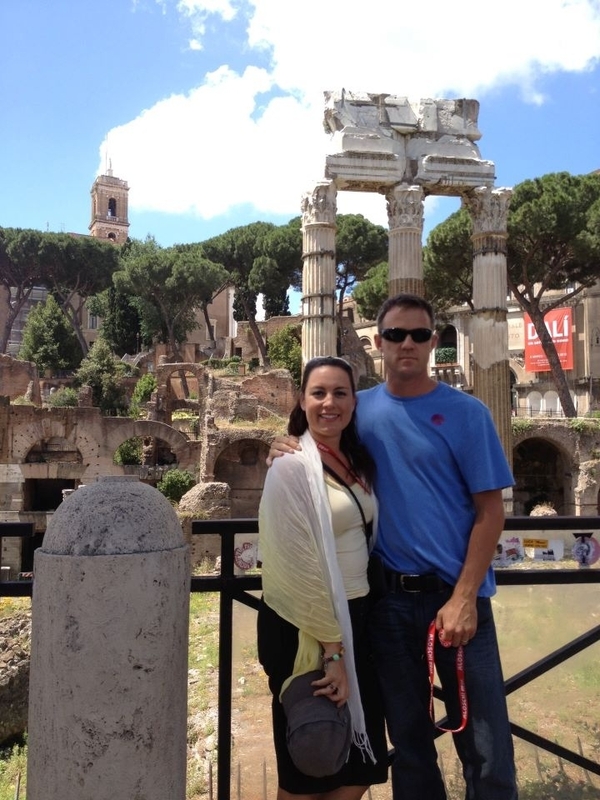 The Roman Forum became the spectacular showcase of the Roman Empire filled with beautiful statues and architecture. The main sight of the Forum include the Arch of Titus (Arco di Tito), the Temple of Saturn, Temple of Vesta, and the church of San Luca e Martina. 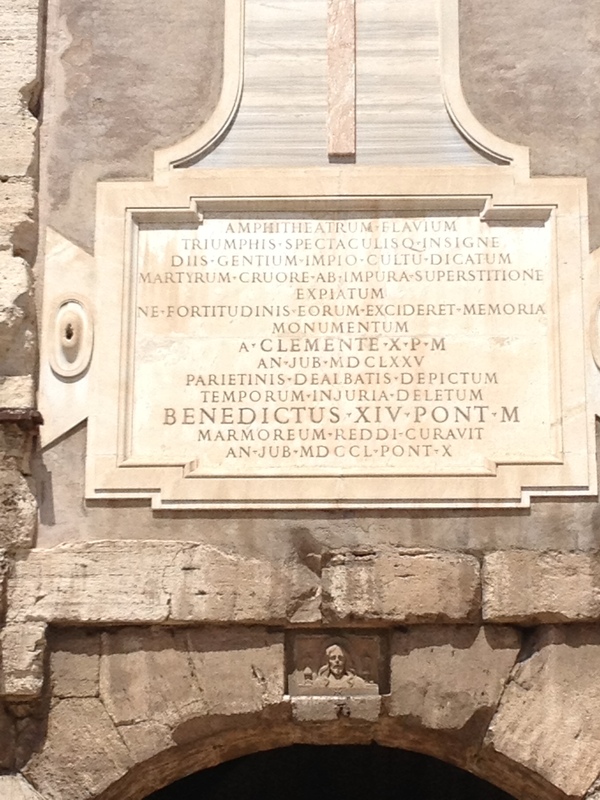 These are all linked by the Sacra Via, the main road through the Forum. The Spanish Steps were in walking distance to our hotel in Rome. We decided to talk there and check them out. History: The Spanish Steps, Scalinata della Trinità dei Monti, are a set of steps in Rome, Italy, located between the Piazza di Spagna at the base and Piazza Trinità dei Monti, with the Trinità dei Monti church at the top. These set of stairs are the widest in Europe. This stairway consists of 135 steps and was built with French diplomat Étienne Gueffier’s money of 20,000 scudi, in 1723–1725. The stairs were designed to link the Bourbon Spanish Embassy and the Trinità dei Monti church to the Holy See in Palazzo Monaldeschi located at the bottom of the stairs. 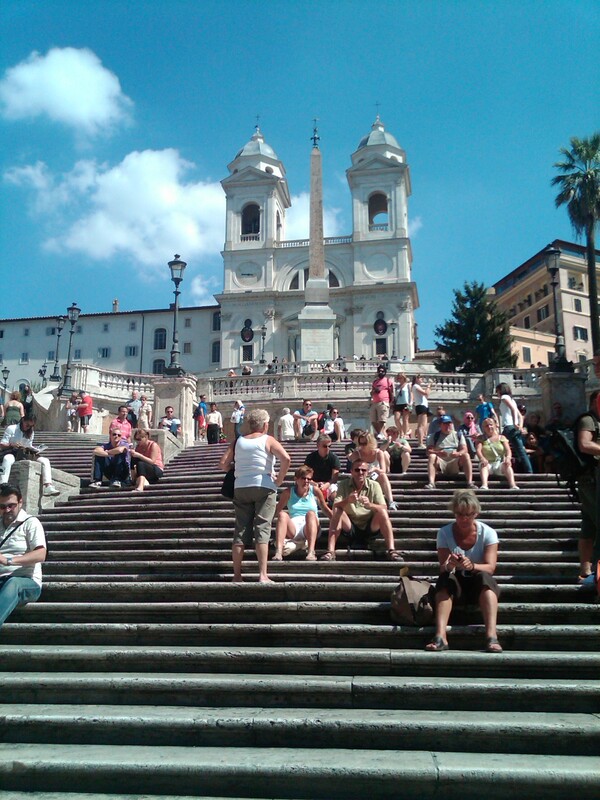 The Spanish Steps were designed by architects Francesco de Sanctis and Alessandro Specchi. $$ saving tips: It was an extremely hot day in June and we were grabbing Panini’s at carts on the sidewalk as we walked around with our tour guide. The Panini’s were very filling and cost only 2€ in comparison to stopping and eating in a touristy area restaurant. We made sure to carry bottled waters in a bag that we took turns carrying. It is cheaper to purchase a tour of the outside of the Coliseum or walk around it on your own for free! The guided tour which takes you on the inside is more expensive. If you are near the Spanish Steps, than I would make it a point to see them or walk on them. 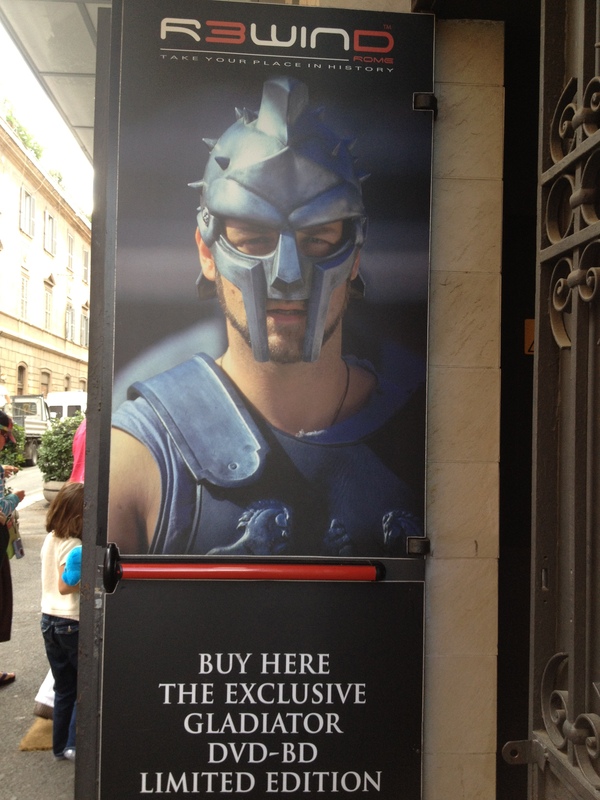 It wasn’t my favorite part of Rome. It was so hot and crowded there. They didn’t allow you to eat on the steps, so we had to leave with our ice cream cone and then come back. There really isn’t anything to do there but sit on the steps, that is, if you can even find a seat. However, there is a ton of high end shopping around the steps. 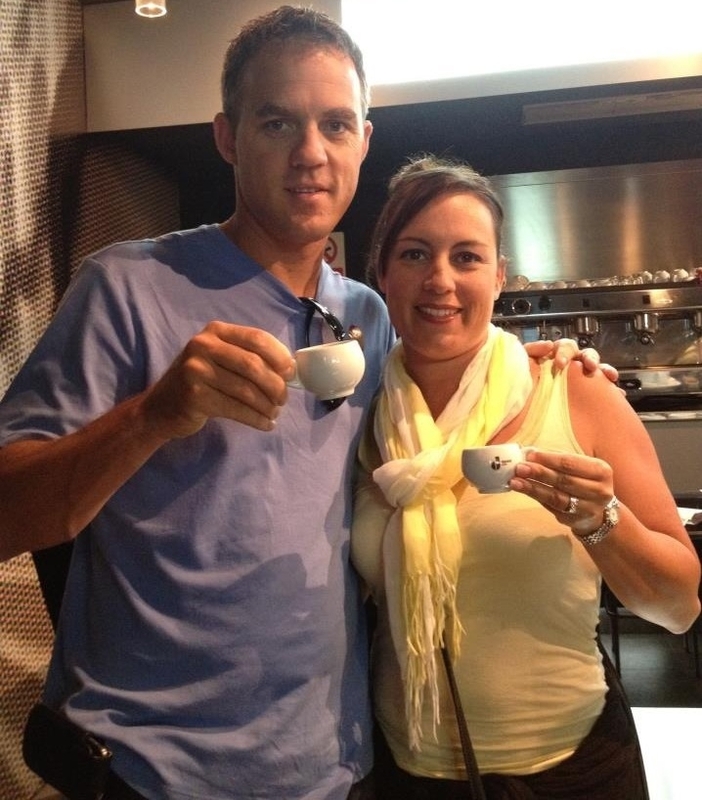 If you are not up for high end shopping, just walk around and visit the coffee shops and window shop. Great leather shoes down some of the alley ways. 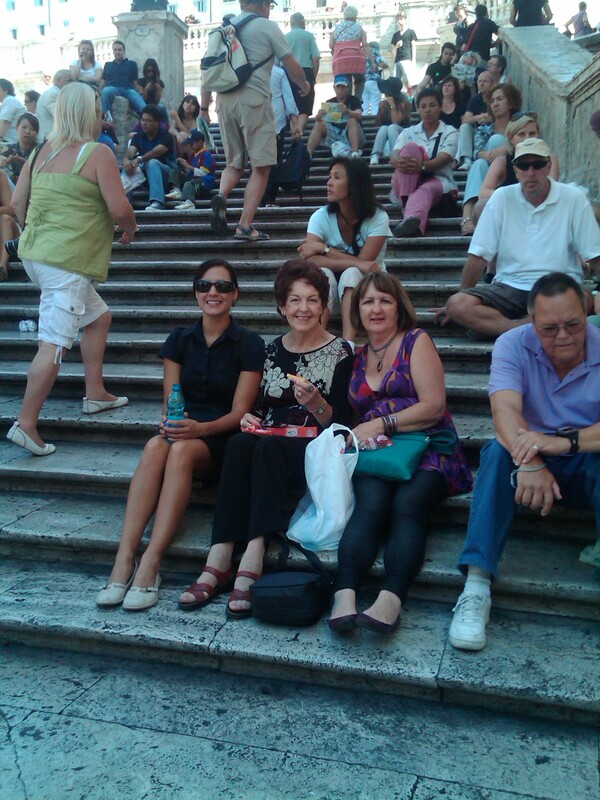 The Spanish Steps are free to visit and just walking distance from the Trevi Fountain!! !